Now I know it’s never usually a good idea to mess with a classic, and honestly, if I could only GET Schweppes lemonade here in New York, I’d never have bothered experimenting, but I can’t so I did, and honestly, Pimms with ginger and prosecco is absolutely worth having in your summer cocktail rotation. Lime and lemon, sure. Sprite, yes, but with Pimms, absolutely not. Last year we bought a few ruinously expensive cans from Tea and Sympathy (cost more than the Pimms), and made our own lemonade (pretty successfully really) with soda streamed water, lemons and sugar syrup. I am aware that this is the absolute definition of a First World Problem, and so is the solution we cam up with this year: really good spicy ginger beer and prosecco. Really. I’m almost ashamed to tell you about it, only it tastes so good! 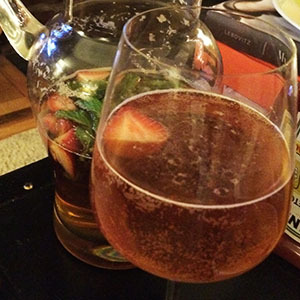 So you make regular Pimms, basically. Cucumber, strawberries, mint, apple maybe, orange slices, blueberries … wherever your aesthetic and fridge leads you. Let the fruit sit in the Pimms for ten mins or so, then top up the jug with bubbles. So, proportions: 1 part Pimms, 1 part ginger beer 1 part prosecco. Easy like a sunny afternoon. This entry was posted in Uncategorized and tagged cocktail, easy, ginger, ginger beer, Pimms, prosecco, summer. Bookmark the permalink.